If a new World Economic Forum (WEF) report is to believed, emerging tech will create more jobs than it destroys. At least for the next four years. Specifically, The Future of Jobs Report 2018 predicts the loss of 75 million jobs by 2022, and the creation of 133 million jobs over the same period, for a net increase of 58 million jobs. That’s obviously good news, but this extraordinary swing in jobs will pose a challenge to both employers and workers. For employers, it means making the right investments in technology; for workers, it means acquiring the right skills. To create its report, the WEF surveyed executives, especially chief human resources officers, from 313 of the world’s biggest companies, representing over 15 million workers in 20 developed and emerging economies. The companies represent a diverse set of industries, including automotive, aerospace, supply chain and transport, travel, financial services, healthcare, IT, mining and metals, oil and gas, professional services, and others. The authors of the report identified four primary drivers of change that will dominate from now until 2022, namely ubiquitous high-speed mobile internet, AI, the widespread adoption of big data analytics, and cloud technology. These changes will happen in conjunction with other trends, such as the expansion of education among the middle classes (particularly in developing economies), and the shift toward a greener global economy. Among the companies surveyed, 85 percent they’ll likely expand their use of big data analytics between now and 2022. An equally large proportion of companies said they’re either likely or very likely to adopt and expand their use of such technologies as the internet-of-things, app- and web-enabled markets, and cloud computing. Other technologies tabled for near-future investments included machine learning and virtual reality. 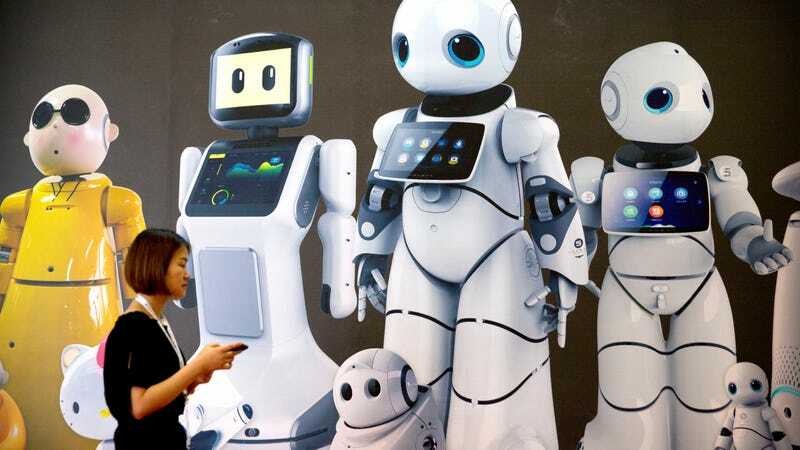 Robots are also attracting significant business interest, namely stationary robots, non-humanoid land robots, and fully automated aerial drones, in addition to machine-learning algorithms and AI. Between 23 and 37 percent of the companies surveyed said they plan to make investment of this sort (depending on the industry). These companies also said they plan to expand their use of contractors and remote workers. They’re also expecting big shifts in regards to existing work tasks. Areas expected to see increases in automation include communicating and interacting (from 23 percent in 2018 to a projected 30 percent in 2022), coordinating, developing, managing, and advising (from 20 to 29 percent), and reasoning and decision-making (from 18 to 27 percent). By 2022, WEF expects that job losses due to automation will decrease from 31 percent to 21 percent, a 10 percent decline. Half of today’s core jobs (defined as “making up the bulk of employment across industries”) should remain stable until 2022, according to the authors. A whopping 54 percent of all employees will require “significant” training to either upgrade their skills or acquire new skills altogether. Of these, 35 percent will require an additional six months of training, 9 percent will require training lasting six to 12 months, and 10 percent will need more than a year to upgrade their skill set. By 2022, “everyone will need an extra 101 days of learning,” according to the WEF. Nearly one in four companies said they’re undecided or unlikely to pursue the retraining of existing employees. Two-thirds of employers expect their workers to either adapt or pick-up skills as their jobs evolve. Anywhere from half to two-thirds of companies said they’ll just resort to hiring contractors, temporary staff, and freelancers to address any deficiencies in work skill. As noted, this report is based on the expectations of industry officials, and the kinds of investments their companies are expected to make over the short term. Market forces, along with unforeseen technological and socio-economic trends, could change the business landscape in ways we can’t predict today. Indeed, the authors of the report themselves admit that “these estimates and the assumptions behind them should be treated with caution, not least because they represent a subset of employment globally,” adding that the “findings described throughout the report are not foregone conclusions but trends emerging from the collective actions and investment decisions taken or envisaged by companies today.” The usefulness of the report is in “highlighting the types of adaptation strategies that must be put in place to facilitate the transition of the workforce to the new world of work,” write the authors. Finally, it’s important to recognize that this report only covers the period 2018 to 2022, which is an exceptionally small time frame. No doubt, the predictions made in the report could very well hold true. We may even witness similar trends and ongoing positive employment growth from 2022 to 2026, and even beyond that. But AI and robotics will continue to get stronger, eventually matching, and then exceeding, human capabilities in virtually every conceivable domain. It’s thus hard to imagine this trend lasting into the 2030s and beyond. Some of the biggest thinkers in this field, including Microsoft founder Bill Gates, SpaceX CEO Elon Musk, How Stuff Works Founder Marshall Brain, and futurist Martin Ford, have expressed their concerns about the prospect of technological unemployment. So while encouraging, this new report should not guide us towards complacency. The time to start planning for massive employment disruptions is now.